Eleanor of Aquitaine (ca. 1122 - 1204) - Eleanor of Aquitaine stands out as an almost unique figure in history. She is virtually the only woman to attain a stature equal to that of the most powerful men in Europe at a time when women were often regarded as little more than livestock in society. She lived in the period known as the "High" Middle Ages (roughly the time between 1000-1300) when life was hard and culture violent. Notice on this chart that there are no other women posted from this era, and that she lived about three centuries before Joan of Arc, the next woman of prominence closest to her in time. How was she able to pull off this remarkable feat? Well, of course, she was born into privilege which was just about the only way to become powerful in this era. Her family was the Ramnulfid dynasty (or House of Poitiers) which was a royal line from southwestern France. Also, she was the oldest child of Duke William X of Aquitaine. Even so, she had a younger brother, William Aigret, who as a male, would normally have been his father's heir. But he died at the age of only four, leaving William with just two daughters. So he made Eleanor his heir. And her father saw that she lacked for nothing. By all indications she received the best education possible (another rarity for women at this time). She learned Latin, studied music and Literature and even learned how to hunt and horseback ride. As far as her personal qualities go, she was considered intelligent and strong-willed, which would both help and hurt her over the course of her life. William died when Eleanor was still a young girl and she became Duchess of Aquitaine Suo jure ("in her own right", as opposed to through marriage). Because of her age, and newly acquired wealth, Eleanor became the most highly sought after bride in Europe. In July 1137, she married Prince Louis of France, and just days later, they became King Louis VII and Queen Eleanor, when Louis' father, Louis VI, died. This is the same Louis who led the Second Crusade, and Eleanor accompanied her husband to the Holy Land (her uncle, Raymond was also ruler of the Crusader Kingdom of Antioch). But the marriage was ultimately unsuccessful and annulled in 1152. Eleanor had failed to give Louis a male heir, and Eleanor couldn't stand Louis; although the official reason from the Catholic Church was consanguinity (Louis and Eleanor were third cousins once removed - a pretty flimsy excuse). Only eight weeks after the annulment she married Henry II of Normandy. Two years after that, Henry became King of England, and Eleanor had become queen for a second time. Whereas she had no sons with Louis, her marriage to Henry produced five (as well as three daughters). Three would be crowned King of England. However, Henry the Younger would revolt against his father and try to overthrow him in 1173. It was put down and Eleanor was implicated in assisting Henry the Younger, and thrown in prison for 16 years. 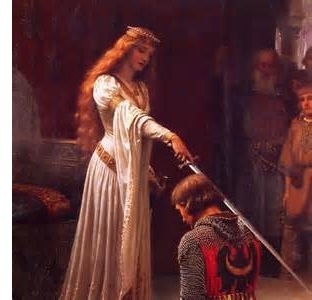 On the death of her husband, her son Richard became king and ordered Eleanor's release. She ruled England in Richard's name while he was away on the Third Crusade, and personally negotiated his release from Leopold of Austria. But when her youngest son, John, became king, she stepped aside and lived the rest of her life peacefully, dying in 1204. Besides her wealth and her power, contemporary sources describe her as having great beauty as well. A remarkable individual who managed to buck the trend of Medieval culture.